to help your clients more easily reach customers as they spend time on millions of sites in the Google Display Network. As you already know, with contextual targeting you can reach potential customers as they read web pages related to your clients’ products or services. Now, with this tool, you can create contextually-targeted campaigns more easily and quickly, while generating more clicks and conversions for your clients’ campaigns. This tool automatically builds keyword lists that can be used to show your clients' ads on relevant web pages in the Google Display Network. Tightly-themed keyword lists are the basis of effective contextual targeting, and with the Contextual Targeting Tool, you no longer have to build them manually. In minutes, you can build dozens, even hundreds, of keyword lists, scaling client's campaign performance while ensuring accurate targeting for their ads. This means they can get more clicks and conversions for campaigns and you can create these campaigns more quickly. Many of you have previously been using the Wonder Wheel tool to do this. 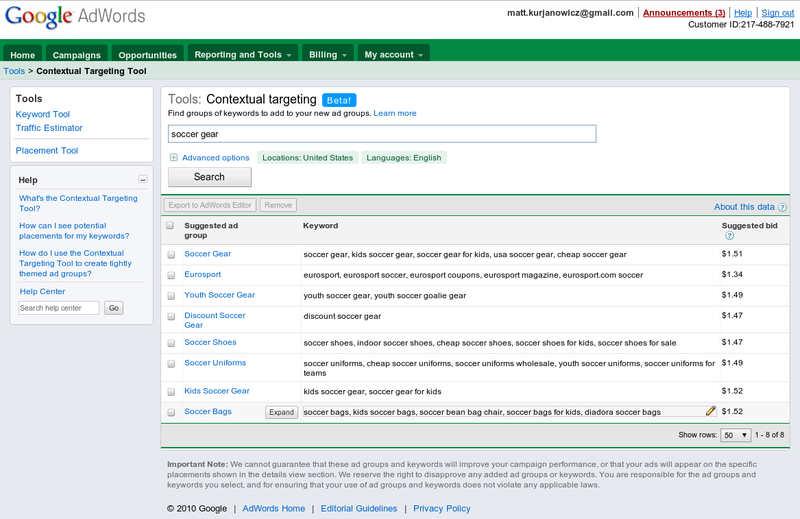 The Contextual Targeting Tool now automates this process, and it does it right within clients' AdWords accounts. Let’s say your client sells soccer equipment and gear. Normally, you'd have to manually build out separate ad groups for each of your product lines, like soccer gear, soccer balls, soccer cleats, etc. With the Contextual Targeting Tool, simply type each product category into the search box, and the tool will automatically generate tightly-themed keyword lists for you. For example, when you enter soccer gear into the tool, you get more specific ad groups, such as youth soccer gear, discount soccer gear, soccer uniforms, soccer bags, etc. Along with the new ad groups, the tool provides suggested bids and predicted placements to give you an idea of the types of sites in the Display Network where the ads can appear. 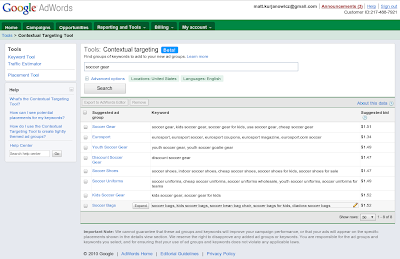 The Contextual Targeting Tool has been available to agencies and advertisers using AdWords Editor. This week, you will be also able to access it from the Opportunities tab in AdWords accounts, although for now you'll still need AdWords Editor to implement the ad groups in clients' accounts (download AdWords Editor). However, this requirement will be lifted and you’ll be able to implement new ad groups directly from AdWords accounts in the coming months. You can learn more about using the Contextual Targeting Tool by watching this video. We hope this tool will help you more easily and efficiently reach your clients’ goals with their Display Network campaigns. Last week, we launched the Contextual Targeting Tool to help your clients more easily reach customers as they spend time on millions of sites in the Google Display Network.